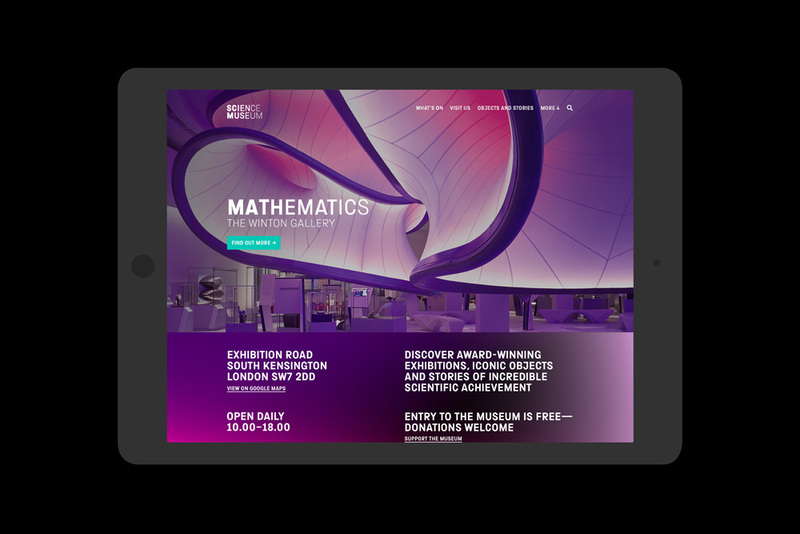 Dating back to 1858, the Science Museum in London offers a collection and exhibits that provide a “record of scientific, technological and medical achievements from across the globe” and welcomes over 3 million visitors a year. It is part of the Science Museum Group, a public sector organization that also manages the National Railway Museum (in York), the National Science and Media Museum (in Bradford), and the Museum of Science and Industry (in Manchester). 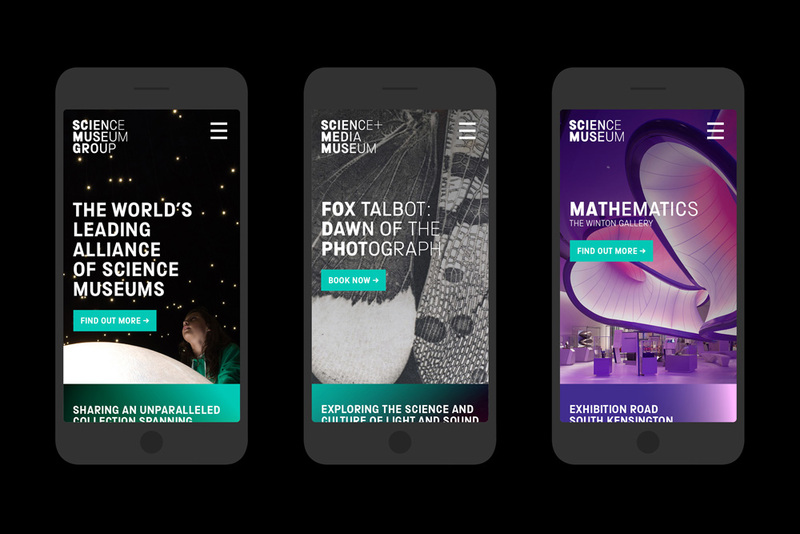 This week, the Science Museum Group introduced a new overarching identity for the organization and its flagship Science Museum, designed by London-based North. 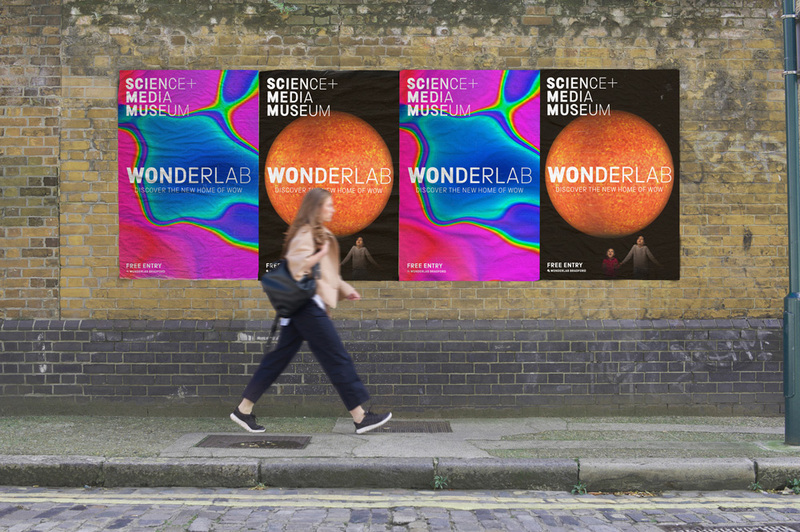 Developed by North, the new brand aims to bring a visual cohesion to all of the museums that make up the Science Museum Group and share an astonishingly diverse and important collection spanning science, technology, engineering, mathematics and medicine. 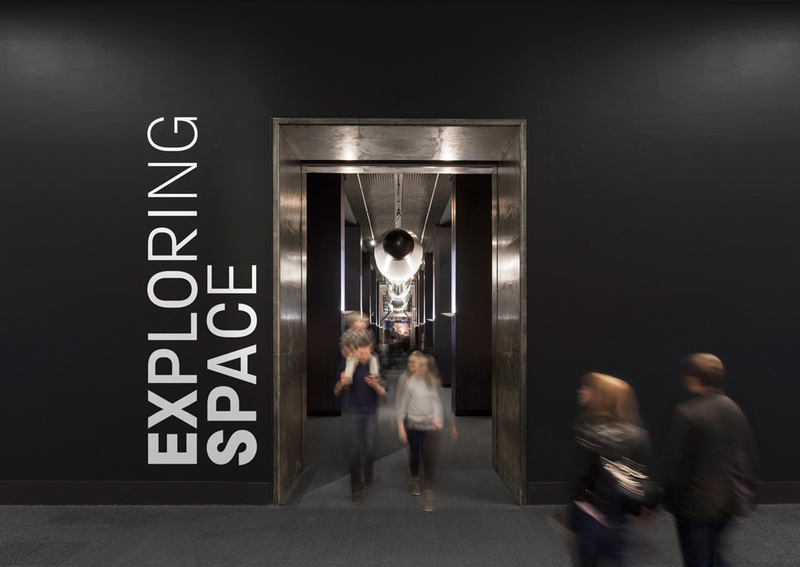 North were briefed in the summer of 2016 to develop a visual language that helped the Science Museum Group project itself as a cohesive family of museums with a shared vision. 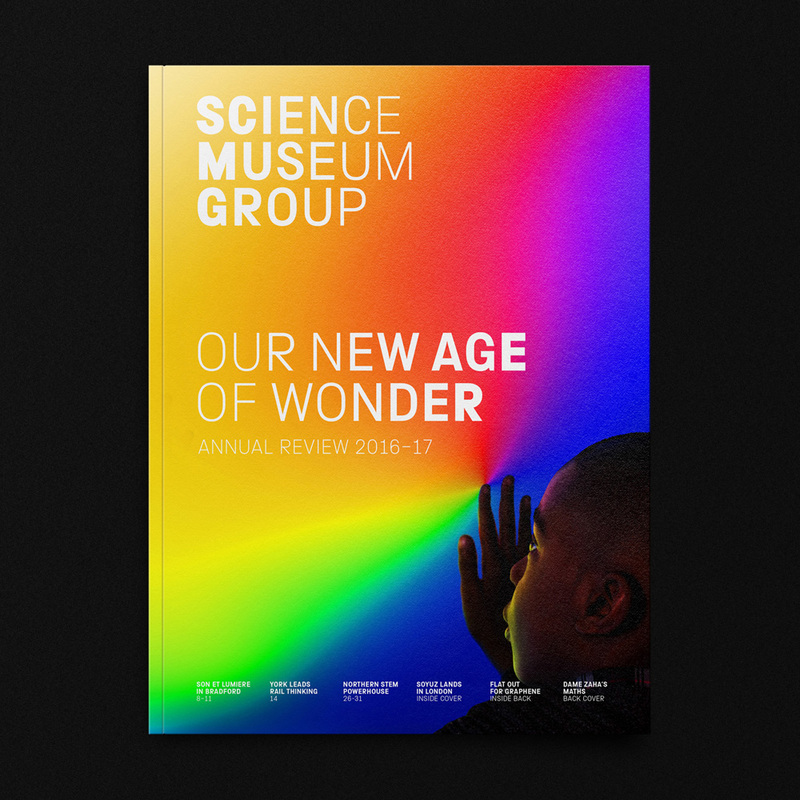 This aspiration to align and harness the value of the group was driven by a number of key developments; a decision to treat the objects each museum holds as a single Group collection, searchable online; an increase in shared programming, with more exhibitions moving between museums; a decision to revamp the group’s web estate; and a desire to update the Science Museum’s logo and visual identity to better reflect the development of the brand in recent years. 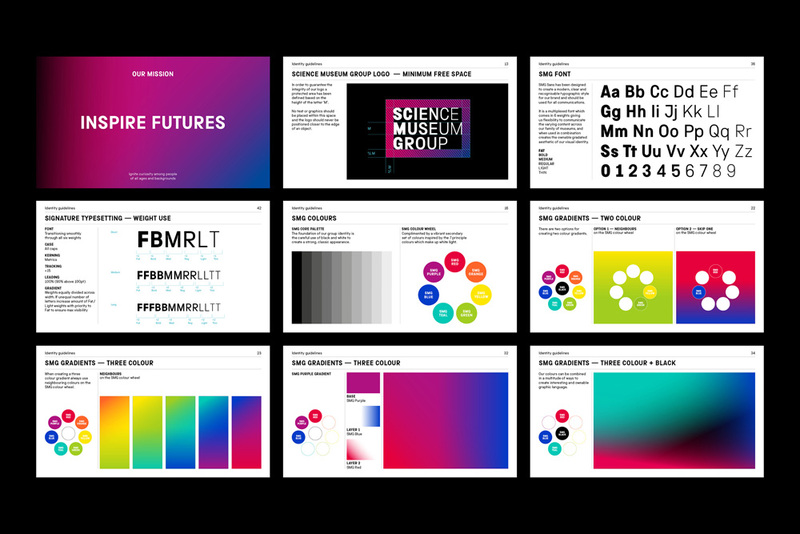 The brand mission [‘inspire futures’] inspired the idea of illumination as a central feature of the new identity, explored both through the gradated font weight in the new logos and the use of vibrant colour gradients elsewhere within the graphic language. Working with type foundry Fontseek, SMG Sans, a customised uniwidth font has been developed. The multiplex design of the font (where the letters maintain the same width across weights) allows typography to retain a consistent shape and position while the font weight gradates and animates. 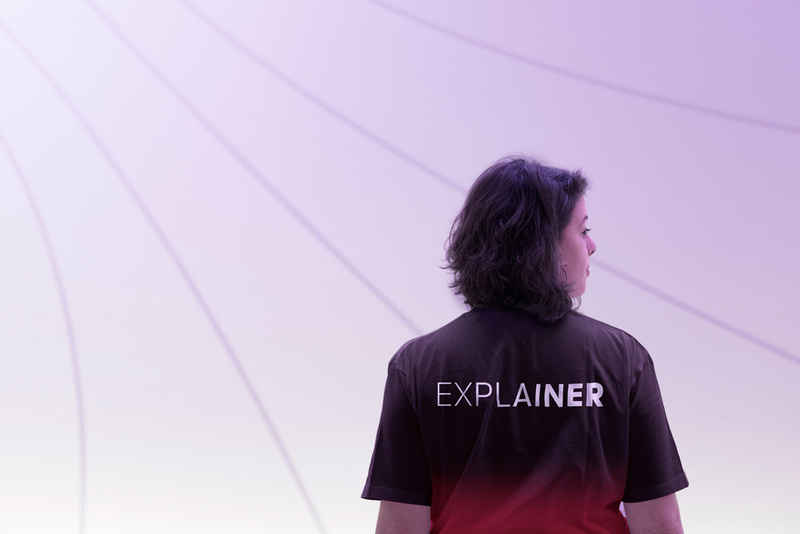 Science Museum logo (static and animated). National Science and Media Museum logo (static and animated). This first section might be a little bit more than usual to digest as there are a few too many logos to look at. You can ignore the National Railway Museum and Museum of Science and Industry logos as those remain the same. Then we can turn our focus to the Science Museum logo, which is the most well known entity among these and the one most designers know of. Designed by Johnson Banks in 2010 it has always been a majority crowd pleaser. It had a nerdy aesthetic completely its own and a fun, range of applications that made science feel exciting and inclusive. If there was one negative aspect to it, it was perhaps that its font leaned too heavily into the science fiction camp and less into regular ol’ science not involving aliens and spaceships. Still, it was a fantastic identity and, among designers, any design replacing it is swimming against the current from the start. The new logo leaves behind any signs of science fiction and adopts a more standard wordmark where the main visual hook is the fading weight of its characters. It’s far from a novel idea but, in this case, I like how it looks like as the fading view of the moon in the dark night sky. 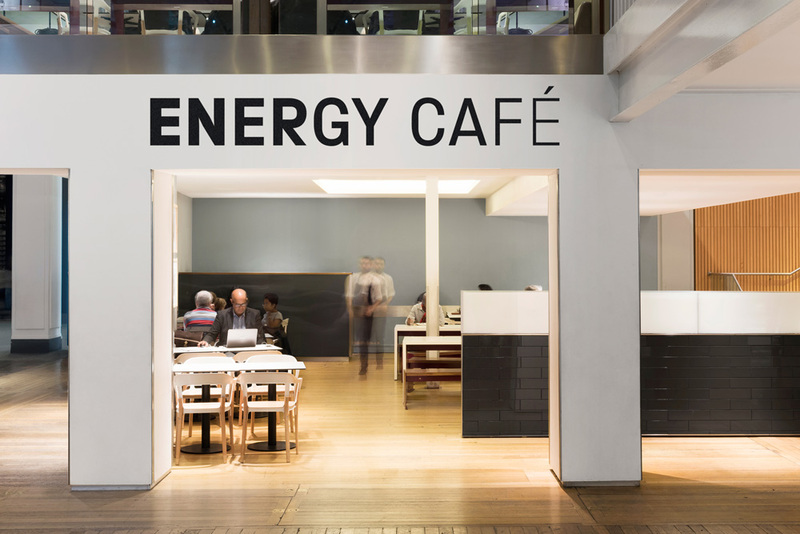 I also like the vertical alignment of the letters (although it sacrifices some kerning issues) that create a tight unit. The animated version is particularly engaging, animating the thickness of the letters in a way that could almost be the opening titles for a Steven Spielberg movie. So, while I do mourn the old logo, I think the replacement does a good job in conceptually and graphically representing science, or, at least, a side of science. From the Science Museum logo, we can then look at the Science Museum Group and National Science and Media Museum logos, which form a nice set of cohesive wordmarks. Not super exciting and somehow having three lines of text instead of two breaks the rhythm but they are serviceable and unified. 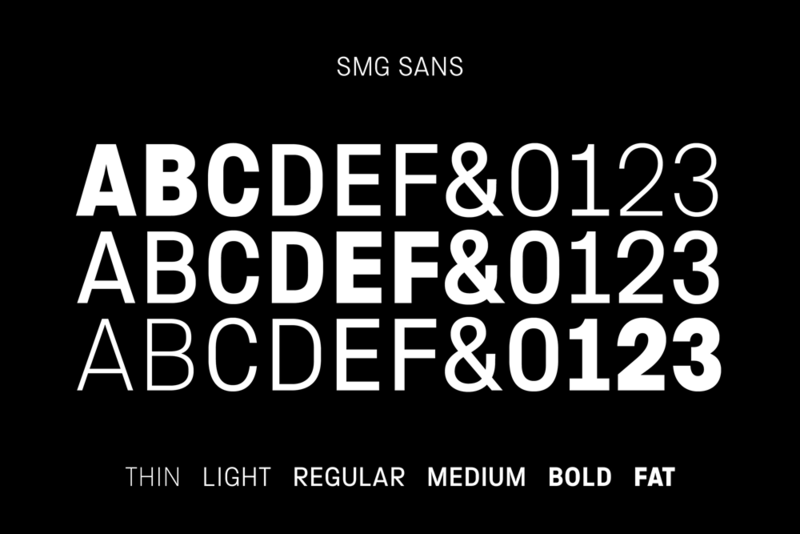 SMG Sans, in collaboration with Fontseek. In application, the recurring thick-to-thin typography may be too much of a good thing. I think the annual report is a good example where it’s hard to tell what’s important when both the logo and the title of the annual report are treated equally. It all just looks like a big type treatment. The Science Museum’s map starts to take things in a better direction, with the single weight supporting typography but I wonder if the system would have benefitted from a contrasting visual voice in the form of a serif, slab serif, or something else. The mesh gradients are cool but I’ll admit I have a weakness for gratuitous, senseless mesh gradients. Photographer Lee Mawdsley was commissioned to create a striking new library of imagery celebrating the intricate beauty of objects within the collection, which the Group harnesses in the biggest educational programme of its kind in Europe to inspire the scientists, engineers, mathematicians and innovators of the future. 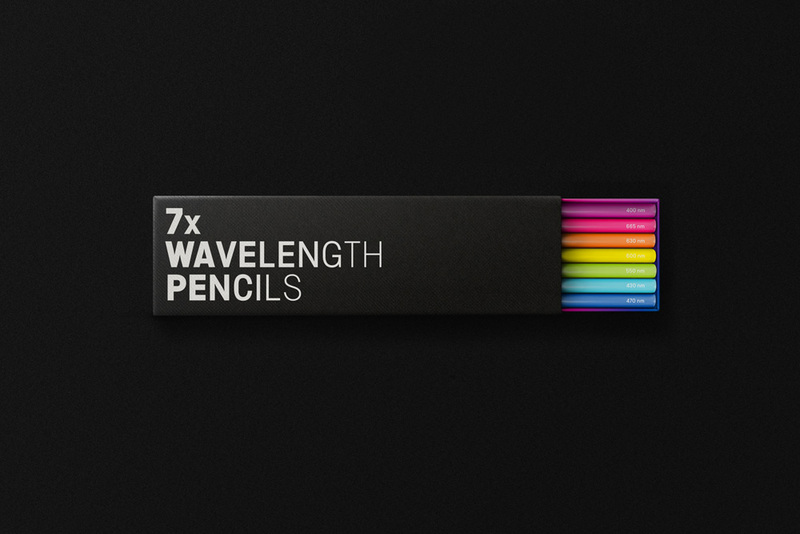 I can easily get behind this kind of merchandise. It’s very museum-shop-y. National Science and Media Museum exterior. The exteriors and interiors of the Science Museum are decent but they are only hitting one single note over and over and it can start to feel tedious and heavy with all the black. 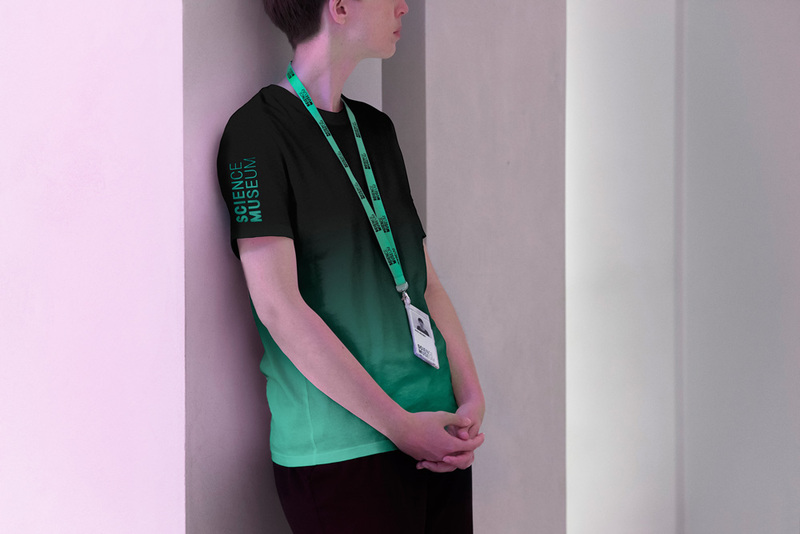 The staff shirts are a nice way of breaking this heaviness with the color blocks fading to black. 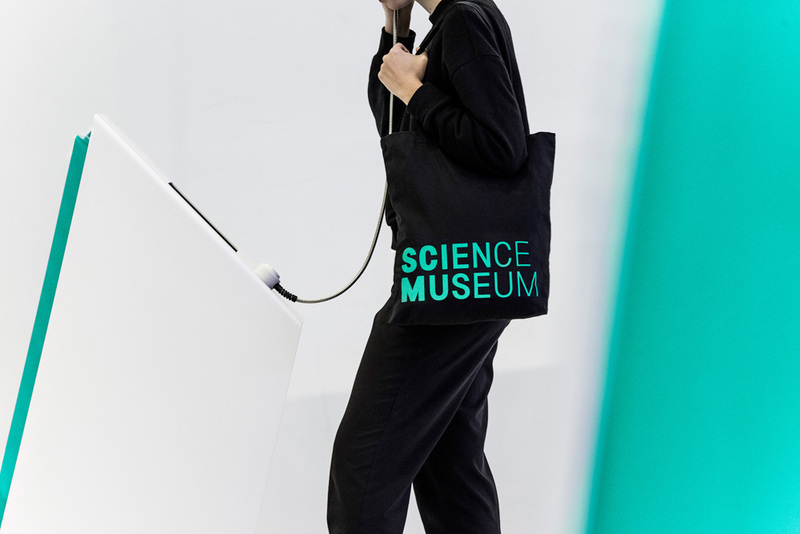 Overall, this lacks the playfulness and more extroverted personality of the old logo and identity and falls in line with the more minimal aesthetic of museum identities around the world which is a little sad, since it doesn’t get more exciting than science. In general I like this new approach well enough because there is something engaging about the fading typography but it needs something else to make it more engaging for the audience than it being a cohesive logo system for the organization. 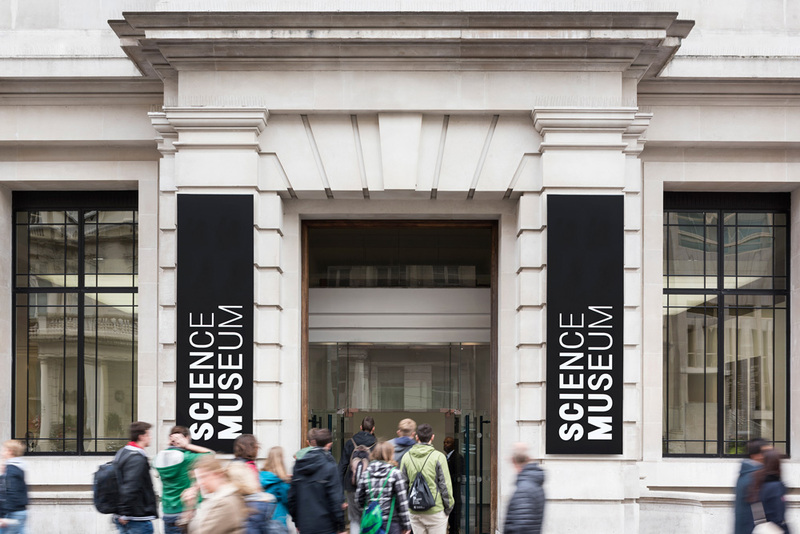 Dating back to 1858, the Science Museum in London offers a collection and exhibits that provide a \"record of scientific, technological and medical achievements from across the globe\" and welcomes over 3 million visitors a year. 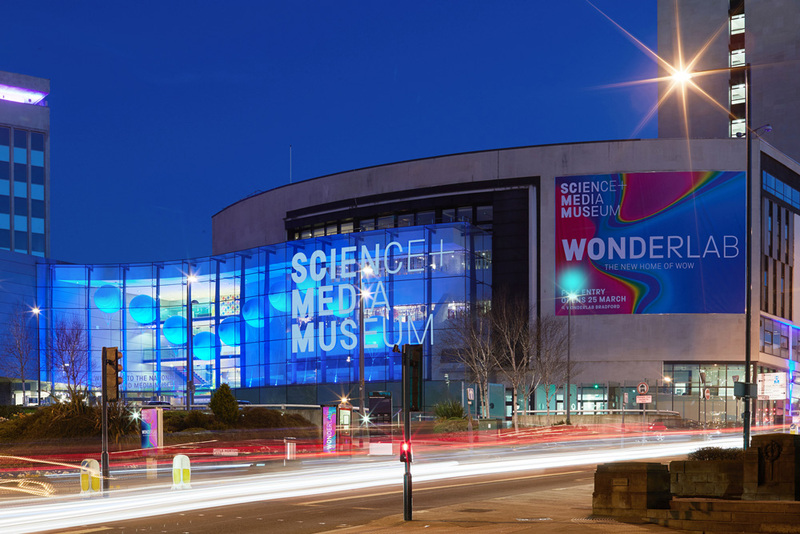 It is part of the Science Museum Group, a public sector organization that also manages the National Railway Museum (in York), the National Science and Media Museum (in Bradford), and the Museum of Science and Industry (in Manchester). 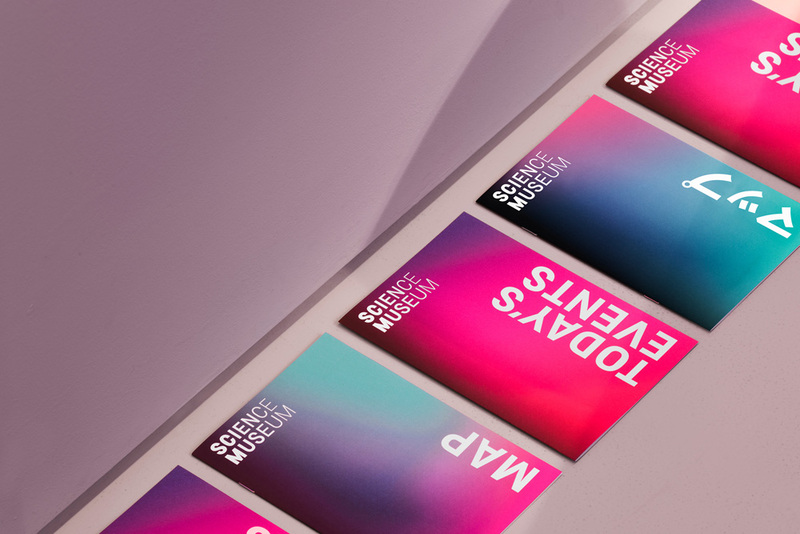 This week, the Science Museum Group introduced a new overarching identity for the organization and its flagship Science Museum, designed by London-based North.